Laser assisted cataract surgery is now available as a surgical option at the Kansas City Eye Clinic. Traditional cataract surgery has been performed effectively and safely for decades and is still a great option for many patients. While traditional surgery uses a blade to to make the incision, the laser makes the incision with specific location, depth, and length based upon the 3-D image of the eye captured during surgery. The cataract is encapsulated in a clear bag and in order for the surgeon to remove the cataract, the front of the bag will need to be opened. During traditional surgery, the surgeon will use surgical instruments to make a circular opening in the front of this bag. However, during laser assisted cataract surgery the laser makes this circular opening with precision in the center of the bag. In order to remove the cataract, it must first be broken up into smaller pieces. During traditional surgery this is done by inserting an ultrasonic device to break up the cataract. During laser assisted surgery, less energy is applied by the laser to break up the cataract into smaller pieces. 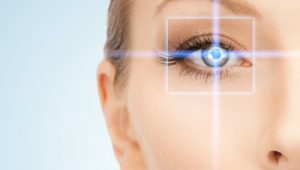 For both traditional and laser assisted surgery, the pieces are removed by a small device and then the intraocular lens implant (IOL) is placed into the eye. Both options produce successful outcomes and happy patients. At the Kansas City Eye Clinic we care about you and your vision. We work closely with you to determine what is important to you and your vision goals. We customize every surgical plan to you and your lifestyle. When you arrive for your Cataract Evaluation, we will take several measurements of your eyes that will produce high quality images and data that the surgeon will analyze and review to recommend the best surgical plan for you. We are constantly working to bring you the best care and the newest technology for safe and successful visual outcomes. If you are ready to schedule your Cataract Evaluation, please call 913.341.3100 or request your appointment here. Standard Package Traditional surgery with a monofocal intraocular lens implant. Provides clear vision for a single distance. It is likely that you will need to wear glasses after surgery for some activities. Monovision is an option: correct dominant eye for distance and non-dominant eye for computer or near vision. Does not correct astigmatism (irregularly shaped cornea that causes blurred or distorted vision). Patients with astigmatism will need glasses after surgery to see clearly at all distances. Covered by insurance (subject to plan deductibles, copays, and coinsurance). Low Astigmatism Package Bladeless laser assisted surgery with a monofocal intraocular lens implant and astigmatism correction. Provides clear vision for a single distance with astigmatism correction. If vision corrected for distance, then will need over-the-counter reading glasses after surgery. Monovision is an option. Additional out of pocket cost for astigmatic correction. High Astigmatism Package Bladeless laser assisted surgery with a toric intraocular lens (IOL) implant for astigmatism correction, with additional astigmatism correction with the laser. Provides clear vision for a single distance with astigmatism correction. If vision corrected for distance, then will need over-the-counter reading glasses after surgery. Monovision is an option. Additional out of pocket cost for astigmatic correction with the toric IOL. Multi-Focus Package Bladeless laser assisted surgery with a multifocal intraocular lens (IOL) implant to minimize the need for glasses after surgery. Astigmatic correction available under certain parameters. Provides clear vision at multiple distances. May need over-the-counter reading glasses on occasion for very fine detail. Additional out of pocket cost for astigmatic and presbyopic correction with the multifocal IOL. Extended Depth of Focus Package (Available with astigmatism correction) Bladeless laser assisted surgery with an extended depth of focus intraocular lens (IOL) implant to reduce the need for glasses after surgery. This IOL has the ability to give you computer and some reading capabilities without glasses. May need over-the-counter reading glasses on occasion for very fine detail. Astigmatic correction available under certain parameters. Additional out of pocket cost for astigmatic and presbyopic correction with the extended depth of focus IOL. Traditional cataract surgery is covered by your medical insurance (subject to plan deductibles, copays, and coinsurance). Your medical insurance will cover the basic surgeon and facility fees, but will not cover the cosmetic and elective costs of fixing astigmatism and/or presbyopia.